Enter Geppetto’s workshop and discover the magic of his wooden puppet Pinocchio. Take part in a not-to-be-missed amazing 3D video slot experience from Betsoft. 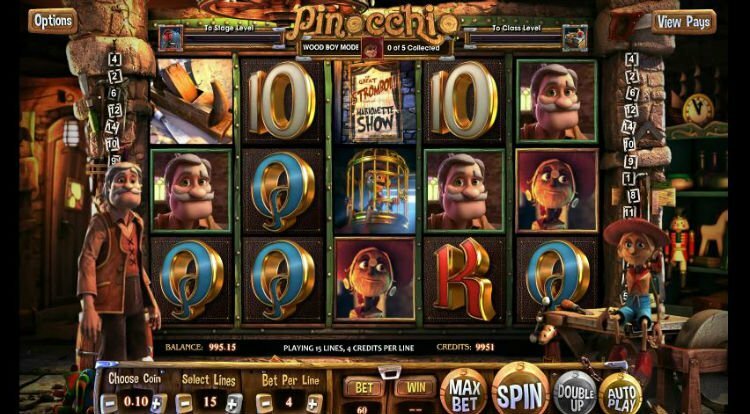 Complete with outstanding visual graphics and over three worlds of bonus features, the Pinocchio Slot is a must-play for any new or seasoned slots player. Betsoft Gaming has created yet another impressive video slot! 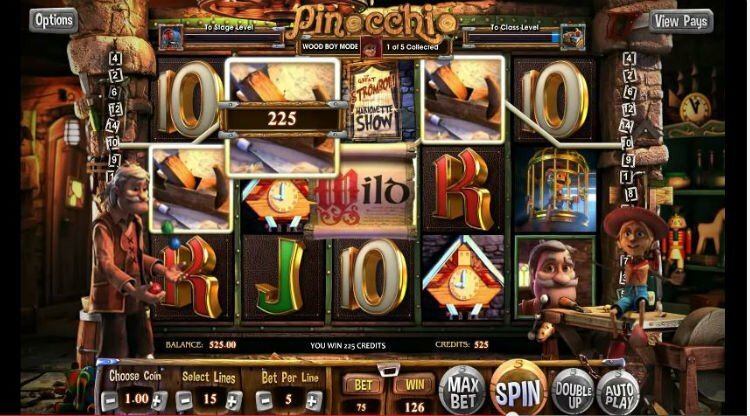 Its Pinocchio slot machine is 5 reels and 30 paylines of non-stop online 3D video slots entertainment at its best. 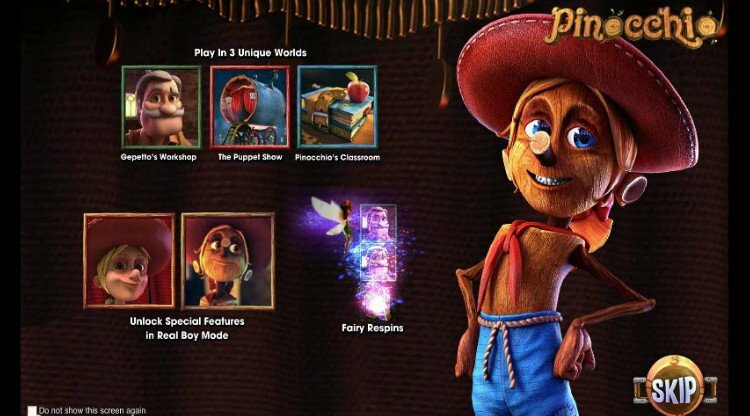 In this Pinocchio slot review you will discover just how incredible a classic fairy tale can be when it is transformed into a premium casino game. Based on the famous 19th century children’s book “The Adventures of Pinocchio” from Italian Author Carlo Collodi, the Pinocchio Slot focuses on the story of the wooden-puppet whose nose grows each time he tells a lie and his wood-carving creator, Geppetto. The slot is a visually stunning three-dimensional masterpiece that comes to life with spinning reels, animations, and sound effects. The reels feature images of the two main characters, a cuckoo clock, a show poster, Pinocchio in a cage, and so on. While the reels spin, Geppetto and Pinocchio cheer you on from the side. On occasion, Pinocchio will jump up and down on the workshop table and Geppetto will juggle or clap. If you were hoping for a Pinocchio Fruits Game you’re out of luck. There is nothing classic about this slot machine with the exception of the story on which it is based. The game has just about every bell and whistle that a video slot can have. All that it’s really lacking is a progressive jackpot. However, you’ll be too busy amazed with its multiple special features, including a changing worlds feature, to even notice. There are several Pinocchio slot bonuses including a changing worlds feature that lets you play in three different worlds, each offering different rewarding opportunities. The first world is Gepetto’s Workshop. Every time a Gepettto symbol appears on reel 3 it will trigger the Wild Scroll feature. The wild scroll moves from right to left and respins each real as it moves. More than one Wild can be triggered simultaneously. The second world is Pinocchio’s Classroom. This world is triggered from the first world when the Classroom meter is full. The meter becomes full after landing ten book symbols that appear on reels 2 and 4. When the meter is full, you are awarded 8 free spins. The Wild Scroll feature is activated when a Book symbol shows up on reel 1, 3, or 5. The Puppet Show is the third world. To activate this bonus in the Pinocchio slot machine, the Stage meter needs to be full, which occurs when ten Wagon symbols are accumulated in the first world. They must appear on reels 2 and 4. This will also reward 8 free spins. When a Wagon symbol results on the middle reel, it activates the Wild Scroll Wild Reel. This turns the entire reel Wild for five respins. In addition, the Pinocchio video slot features a Real Boy Mode that awards Wilds and a Fairy Awesome Respins. Also, as is common with many BetSoft 3D slot machines, the Pinocchio slot game has a Double Up option, which gives you the chance to double your money by guessing Heads or Tails on a gold coin. As long as you keep guessing correctly and you don’t click the collect button, you’ll keep doubling up.